can only be regained by force"
On the occasion of Palestinian Nakba day - the day Palestinians commemorate "the catastrophe" of the establishment of the State of Israel - Mahmoud Abbas' Fatah movement posted a drawing on Facebook that encouraged the use of violence to destroy Israel. 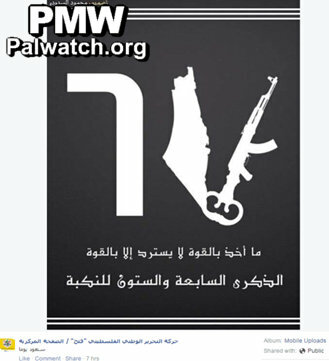 the 67th anniversary of the Nakba"
This statement appeared on an image showing the number 67 in Arabic numerals with the digit 7 made of a key, a rifle, and a map that includes the PA areas as well as all of Israel. Fatah often reiterates its support for the use of violence and arms to gain statehood as Palestinian Media Watch has documented. "When the 'storm' Al-Asifa (i.e., a reference to Fatah's military wing in the 1960's and 1970's) roars and the nation applauds the eternal Fatah, the world's dwarfs should remain in their burrows."